Leslie Kaufman’s recent NY Times article, “My Sons, the Sous-Chefs”, is inspirational. It describes the results of an experiment, now in its 6-month, requiring each of her sons, ages 14 and 10, to cook dinner for the family once a week. They must decide what they will prepare ahead of time, to allow for mom’s yay or nay (the menu must be balanced, fairly healthful) and the requisite grocery shopping. Much has been learned by all involved. Mom has learned to curb her kitchen-control and I-can-do-it-quicker impulses, and the boys have learned about planning and experienced the pride and satisfaction that comes from seeing your loved ones enjoy a meal of your making. I mentioned this article to my girls and their response was, “When can we start!” Since I don’t get home until close to 7 most evenings, I realized that this was not something that could work for us, at this point, on weeknights, since an adult needs to be nearby. But if we aimed for weekend cooking, either for a weekend meal or something that could be prepared and reheated for a weeknight dinner, we could be in business. And so we began! Greta poked around the kitchen, asked a few questions, and for our Sunday night dinner decided to use the ingredients we had in the house. She found a couple of marinated chicken breasts, carrots, a red pepper, and brussels sprouts in the fridge. In the cabinet, jasmine rice. In the freezer, chocolate ice cream. On the baking rack, bananas. She had a plan. Reading the Sunday paper in the living room, I was close by to offer frequent reminders about the importance of proper knife technique (trimming of brussels sprouts, chopping of carrots and peppers), instruct on oven operation, and suggest that the rice be covered for its 20 minutes of steaming. Sometime later, Greta appeared to take drink orders from me and her sister and announce that it was time for us to be seated. And what next? 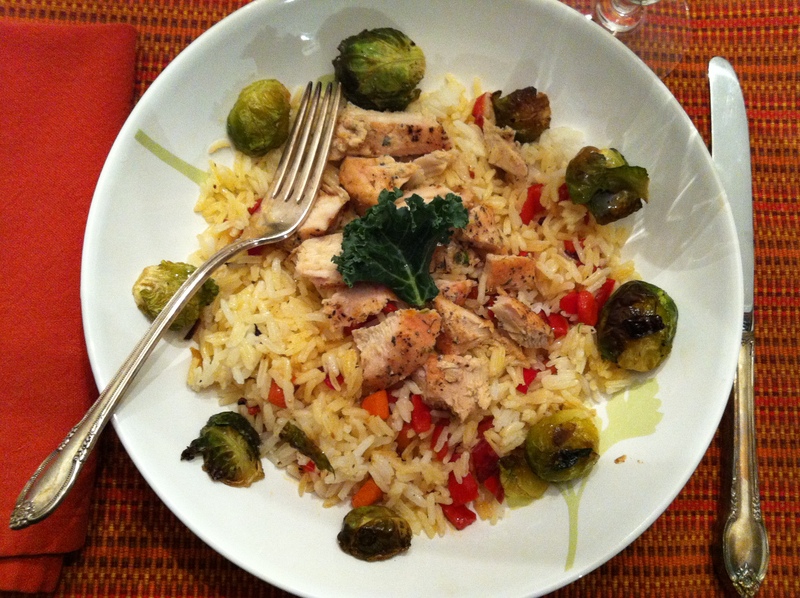 A perfectly plated bowl of pepper and carrot-studded rice, encircled with halved roasted brussels sprouts, topped with sliced roasted chicken breasts, and garnished with a flower of kale! How proud Greta was as she told us that she had added a touch of cumin to the chicken to spice it up a bit. And it is not simply a mother’s pride speaking when I tell you this was a fabulous dinner! But this wasn’t the end of it. 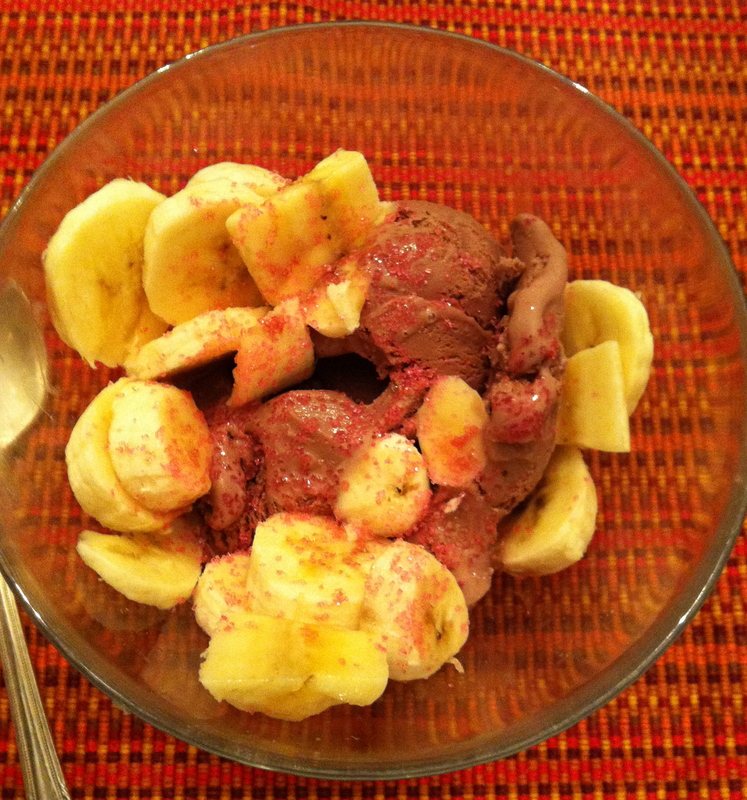 . . as we tuned into Downton Abbey, Greta set down bowls of chocolate ice cream, topped with sliced bananas and a sprinkling of pink sugar. The girl has a knack. I’m impressed! Congratulations to Greta. How did you cook the brussel sprouts? Will look forward to her next menu! Roasted, with salt and pepper, and they were PERFECT! She’ll have to make them for you. Thanks, Dad! Greta was beaming with pride – and over the next two days she told everyone she spoke to that she had made dinner for the family.